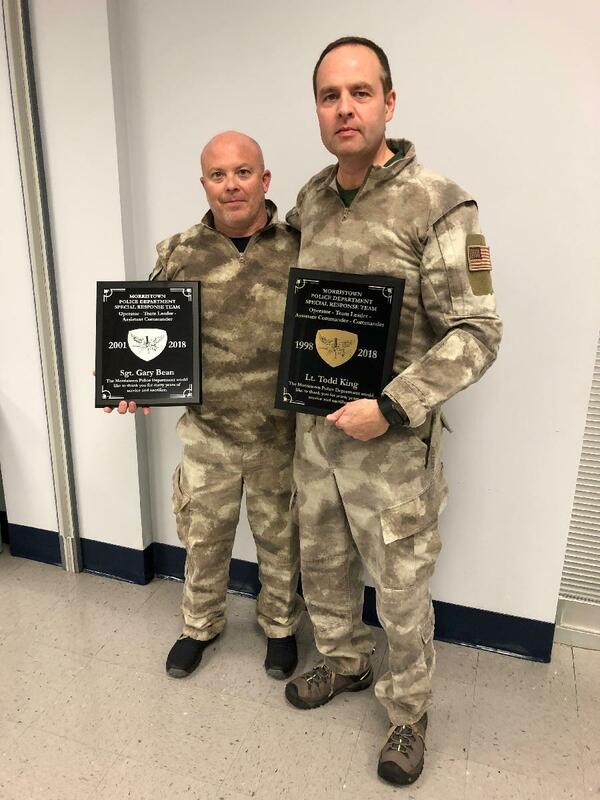 Lieutenant Todd King and Sergeant Gary Bean have more than 30 years of combined experience with the Morristown Police Department’s (MPD) Special Response Team (SRT). On December 21, 2018, they were recognized for their dedication to the team as they have decided to step down from their positions. In addition to his regular position as MPD’s Training Officer, Lieutenant King served as the Special Response Team’s Commander since 2014. Prior to becoming Commander, he was assistant Commander. Lieutenant King joined the Felony Arrest Team in January 1998; shortly after, the name of the team was changed to the Special Response Team. He has served with the MPD since June 1995; working his way through the ranks of patrol to Narcotics where he spent the bulk of his career becoming the Narcotics/Vice Division Sergeant. In 2014, Lieutenant King chose to take a lateral position as Training Officer and was promoted to Lieutenant on June 17, 2015. Sergeant Gary Bean’s daily assignment is Narcotics/Vice Sergeant. He has served with the department for over 19 years. Sergeant Bean joined SRT in February 2001 and became Assistant Commander in 2016. Sergeant Bean began his career as a patrol officer, working his way up through the ranks to Narcotics/Vice Corporal. He was promoted to Detective Sergeant and assigned to General Investigations in 2014. In 2018, he was transferred back to Narcotics/Vice to help oversee operations.